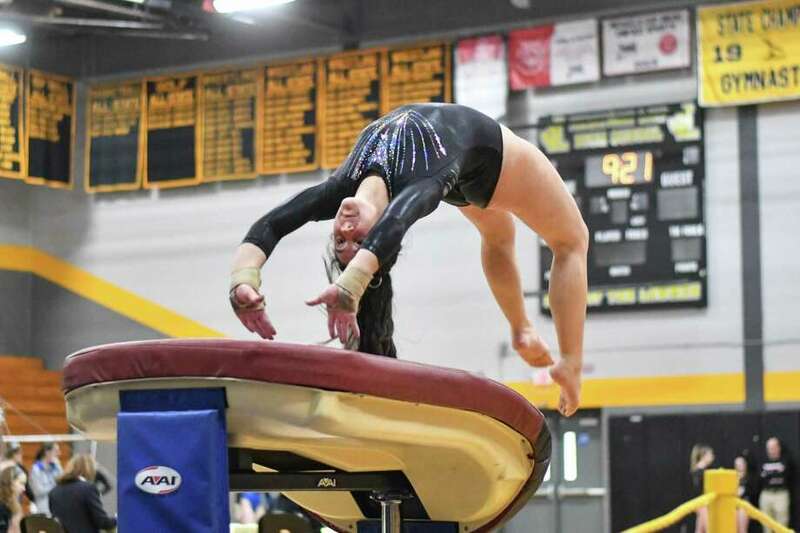 Maggie McMeon of Killingly/Putnam/Tourtellotte competes on the vault during the CIAC Class M Gymnastics Championships on Saturday February 23, 2019 at Jonathan Law High School in Milford, Connecticut. By nature, Gary Chadwick worries at gymnastics meets. By the time his Wilton team got down to its final floor exercise routine in Saturday’s Class M championship, Chadwick believed a second consecutive state title was a distinct impossibility. Unbeknownst to Chadwick and his gymnasts, Wilton had already pulled ahead of the Killingly/Putnam/Tourtelotte (KPT) combined team before Olin stepped on the mat. She came through with a big score anyway. Olin danced, leaped, twisted, turned, and tumbled her way to a 9.70, tying Chelsea Levander’s school record and ending the meet with the highest individual score of the day. Wilton finished with a 131.975 team score, beating runner-up KPT (130.200) by 1.775 points. New Milford was third with 126.100 points, followed by Conard (124.875) and Wethersfield (124.575) rounding out the top five in the eight-team field. The Warriors defended their title — and won the ninth state class championship in program history — despite some uncharacteristic stumbles. In its first season as a co-op, KPT had the meet’s top team scores on vault (34.775) and bars (30.950) to build a 65.725-64.675 lead over Wilton through two events. The Warriors did edge KPT on beam, 32.150 to 31.650, narrowing their deficit to 0.55 going into the floor exercise. Led by McKeon’s 9.225, KPT scored 32.825 points on floor. But Sarah Collias (8.05), Kate Ginsburg (8.40) and Lily Byrnes (9.0) helped Wilton take the lead, and Olin followed with her showstopper to widen the final margin. Notes: Darien and Farmington tied for sixth place with matching 124.000 scores, and Pomperaug was eighth with a 115.250. Darien did have the highest team score on beam with a 32.375. The Blue Wave’s Nicole Carlo had an 8.675 to tie KPT’s Kiera O’Brien for first in the event, while teammate Lana Schmidt was third. New Milford’s Thea Spinner had the best score on uneven bars (8.550), while Olin was tops on vault (9.400) and floor (9.700). Because the class meets are team competitions, individual honors were not awarded. 1. Wilton – 131.975; 2. Killingly/Putnam/Tourtelotte – 130.200; 3. New Milford -126.100; 4. Conard – 124.875; 5. Wethersfield – 124.575; 6. (tie) Farmington – 124.000, Darien 124.000; 8. Pomperaug – 115.250. Vault: 1. Jessica Olin (Wilton), 9.400; 2. Maggie McKeon (KPT), 9.325; 3. Lana Schmidt (Darien), 9.000.